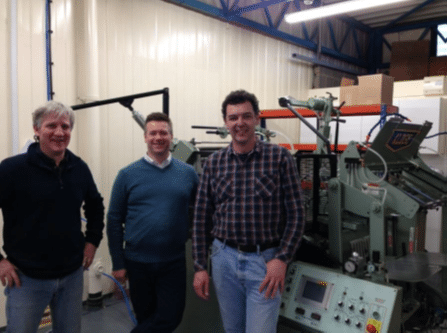 MURRAYS THE PRINTERS, based in Milton Keynes, UK, have recently installed a Kluge EHG Foil Stamping, Embossing and Die Cutting Press. The press was delivered with the EZ Load Magazine – an optional feature which enables the operator to lower and raise the height of the entire magazine with the simple turn of a switch. Designed to accommodate an image area of up to 22×30” and at speeds of 1700 iph, the EHG Series Half-Sheet Press is suitable for stock ranging from onion skin to paperboard. Established in 1950, Murrays the Printers Ltd were originally based in London but relocated to Milton Keynes almost 30 years ago. They are litho, digital and wide format printers who specialize in high quality, quick turnaround work, as well as in more creative print and project work. They produce a great deal of high end marketing materials for agencies as well as for the automotive sector.